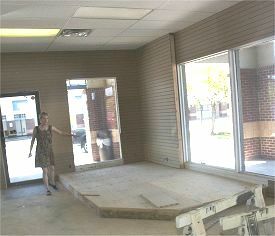 Oh, here is the start of our new accessories area! We were a little careless opening the box... but we'll get it straightened out! My family has been visiting for the past week from IL, WI and DE, so my house has been full, busy, and lots of fun! 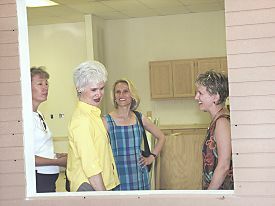 I was showing off our bare walls and cabinets, so I don't know how many faces you'll see here! 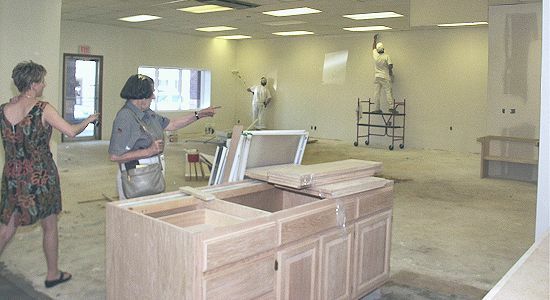 Sad to say, the painters and floor people come in the next two weeks, so my Mom, Sister, and Sisters-in-law won't see the finished shop till their next visit. I think the slatwall looks great... we have sooo many pictures to re-hang now! Here is the base for the raised wooden-floored area, that we have planned for the Vera Bradley Bags! I've ordered a pretty railing... as a decorative edging... and, although you can't see much of them, check out the clean, new ceilings! 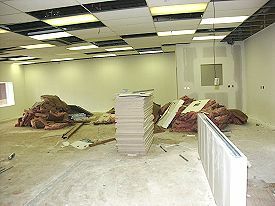 Doesn't seem like a big thing... but when you compare the new ceiling tiles to the old... what a difference! 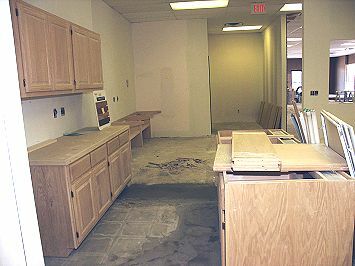 Here are the kitchen cabinets! Not that we eat alot around here...(although our lunch-time-locals think that's all we do sometimes!) 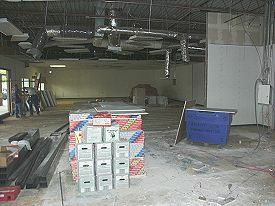 but a place for the snacks, drinks, and a separate lunch area will be great! 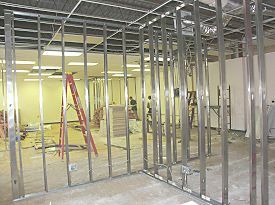 Well, the sheetrocking is done, and slat wall was starting to go up when we were there Tuesday. 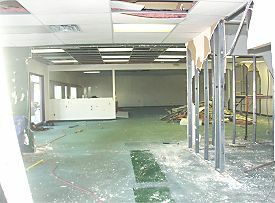 In the top photo, you see the view looking west into what will be the shop space. 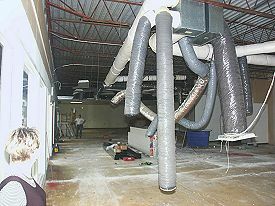 As you can see electricians were hanging from the rafters installing lighting into the ceiling. 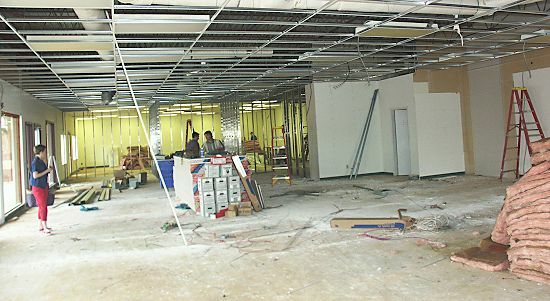 Below left, although it doesn't look like it yet, you are looking through the new kitchen area and into the warehouse/shipping/support area. 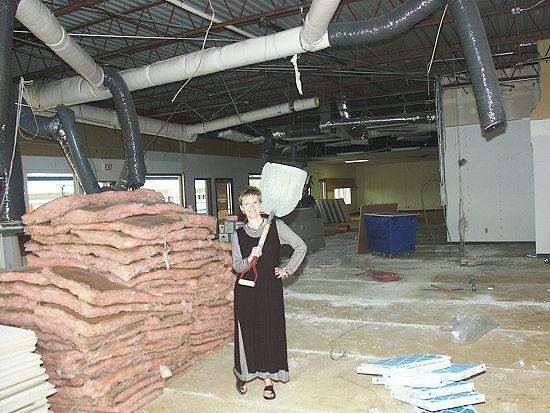 (And you think *your* kitchen looks bad!) 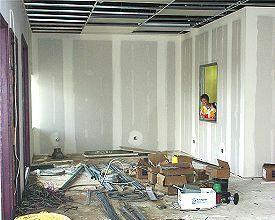 At bottom right, you are looking into the new stitching area, where we'll have a really big table and chairs, so we'll once again be able to welcome people to just come in and stitch. More coming soon! 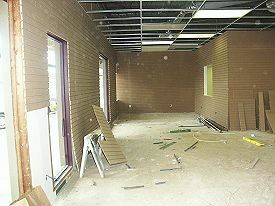 Things are continuing to come together in the new space, though it may be a little difficult to see it from these pics. Sheetrocking is finished, lots of wiring has been done, including what seems like miles of computer network cables. Lindy joked that the network cable alone would make it around the world a time or two. Put your cursor over the photos to see a description. 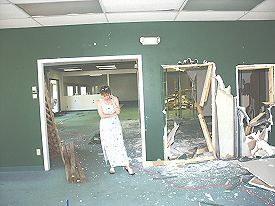 Note: for the pic at the bottom, Lindy leaned through the window into the new stitching area. Even with her there, the photo doesn't really give you a good idea of how large this area is going to be -- it's going to be real cool! Sue, Terri and I walked over to check things out. 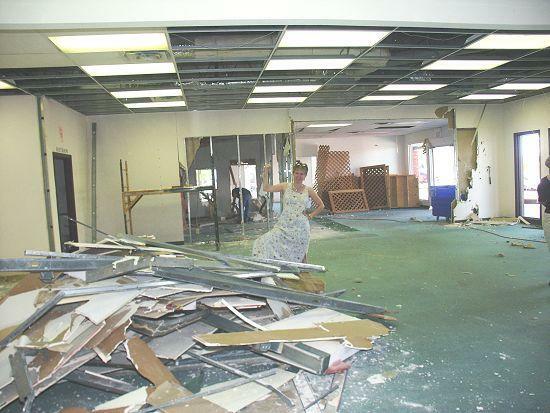 These pictures are so cool to look at, because it was the last day you could see from one end of the shop to the other! 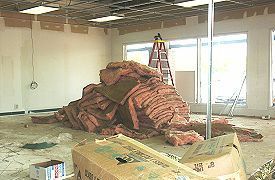 They sheet-rocked Wednesday morning... and I've already had them take down part of one wall that I absolutely hated! I think the workmen are starting to roll their eyes when they see me coming!! Well, here's week 2! Lindy is off at her daughter's graduation from Jr. High today, so you'll have to depend on me for descriptions. All I can say is that the thing Lindy is holding is normally used in this part of the country for shoveling fresh organic matter. However, I promise that wasn't involved here! It does look like an octupus covention, doesn't it? More next week! 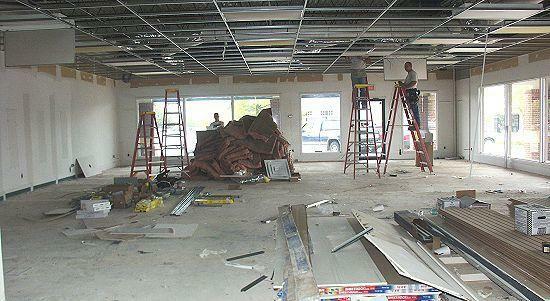 We thought it'd be just as much fun for you to see some of these new-shop build-out pictures as it is for us! 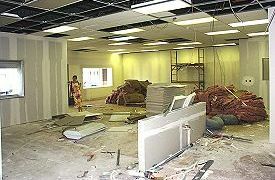 The work started just yesterday... we're having the entire space gutted before we can transform it! Mary got in there with her camera, and we loved what she saw! There I am... 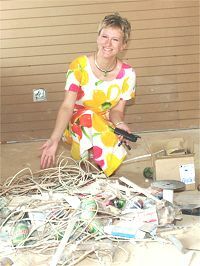 I've just single-handedly torn down two walls, ripping out studs with my bare hands, thrown it all in a pile, and posed for this shot... all in a good linen dress! (Just ignore that workman bent over behind me!) 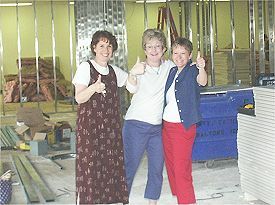 I still have to work on all those walls still standing behind me, but I have to go get my nails done first! Another update in a few days!